LETHBRIDGE THAI MASSAGE & SPA INC | LETHBRIDGE ' S BEST MASSAGE THERAPY! The guiding philosophy of each Massage and Spa journey is to deliver holistic well-being to each individual. We believe that your life force is enhanced through the balance of Body, Mind and Soul. This is achieved by making time for calm moments and allowing rest and rejuvenation. Traditional Thai Massage,Infant/Child/Youth Massage,Advanced Orthopedic,Sport,Soft Tissues,Injury ,Prenatal /Postnatal Massage,Therapeutic Massage,Hot Stone,Sea Shell Massage,Deep Tissue Sport ,Runner’s Massage Therapy,Thai Classic Nerve-Touch Massage,Ancient Royal Style Thai Therapeutic Massage,Thai Medicinal Herbal Compress Massage,Osteo/Thai Warrior Massage,Advanced Thai Medical Massage Therapy,Organic Aromatherapy Oils, East Meet West Tecnique Massage, Foot/Hand Reflexology,Cupping. Each facial is customized to your individual face type. Includes: skin analysis, cleansing, ozone steam, exfoliation, facial massage, masque, serum, moisturizer, eye & lip treatments and face lotion. You will also receive a scalp, neck, shoulder and leg massage. Rejuvenate and detoxify with age-defying body scrubs & wraps. Enriched with powerful anti-oxidants, this restorative treatment will repair stressed skin while helping to protect against sun damage. Great for cellulite. Includes a light massage to finish. 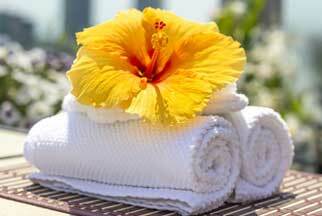 All of our Massage Therapists will treat you with hospitality and a warm welcome. Our Therapists have been fortunate to have the knowledge passed down from generation to generation. We are happy to offer 1 FREE MASSAGE SESSION for every 9 stamps that you collect with our STAMP ME app. Download the app before your next appointment today! Massage & Spa Gift Cards are the ultimate gift of relaxation and rejuvenation, perfect for any occasion. We have over 40 options available, please click below to take a look.